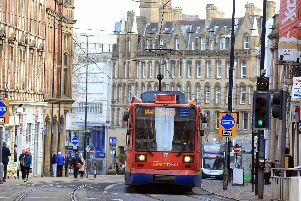 A volatile meeting erupted between taxi drivers and a senior councillor over plans to charge them for driving into Sheffield city centre. Coun Jack Scott, Cabinet Member for Transport, was harangued by a packed room of taxi drivers during the two hour meeting. Despite this, he said he was pleased to be there and looked forward to more meetings. Both black cab and private hire drivers are angry at plans to introduce a Clean Air Zone around the ring road and inner ring road which would see a charge of £50 a day for buses and £10 a day for taxis, lorries, vans and coaches. At the moment, private cars are not affected but taxi drivers say all vehicles should be charged for entering a Clean Air Zone. They say they are being penalised as there are 185,000 private vehicles but only 3,000 have taxi licences. Community campaigner Shahid Ali, who was at the meeting, said: “Coun Scott has to be applauded for turning up to this meeting but there were a lot of angry drivers, unhappy with the charges they will face with an already troubled trade. “Unfortunately this council has made taxi drivers a target in their initiative. Three per cent of vehicles are taxis and cause four per cent of the pollution in the city. The main heavy polluters are the trains and lorries. Mr Ali said most taxi drivers couldn’t afford to invest in more environmentally friendly cabs. “Forcing taxi drivers to buy a £55,000-plus electric cab will mean many will stop driving. Years of neglect of the Sheffield infrastructure has meant that there aren’t enough charging points in the city and people without driveways cannot charge vehicles at home. “To charge public transport – and taxis and private hire vehicles are public transport – is ludicrous. It will make journeys more expensive, making business harder for already hard pressed drivers and businesses. “The sorts of people who rely on private hire vehicles in particular are those who do not own a car but have limited mobility and need to travel to hospital appointments or for trips into town. Coun Scott said air pollution was “a huge public health challenge” across the country, including Sheffield. He criticised the Government for not doing more to help. “The Government should be taking this issue seriously and giving us the tools we actually need. To meet government targets, we have no alternative but to consider introducing charges for the most polluting lorries, vans, taxis, buses and coaches. Clean vehicles won’t be charged, nor will private cars. “I was really pleased to be able to attend the meeting of the Sheffield Taxi Trade Association. As you would expect, taxi drivers had robust views on what the government are requiring us to do. They also completely understood the need to have safer air. “It’s really important we listen to their views and concerns so we can put the right package of grants, loans, investment and support in place to help improve and upgrade Sheffield’s taxis. I’m looking forward to more meetings in the future. At the moment, private cars are not affected but if the council can’t cut pollution rates by 2022, the scheme could be widened to include individual drivers. Coun Scott said he did not think this would be necessary and that charging commercial vehicles should be enough to reduce nitrogen oxide levels. Around £10 million worth of loans and grants will help taxi drivers and bus companies upgrade.